At least that’s the reason Rick gives in the latest episode of Rick and Morty. 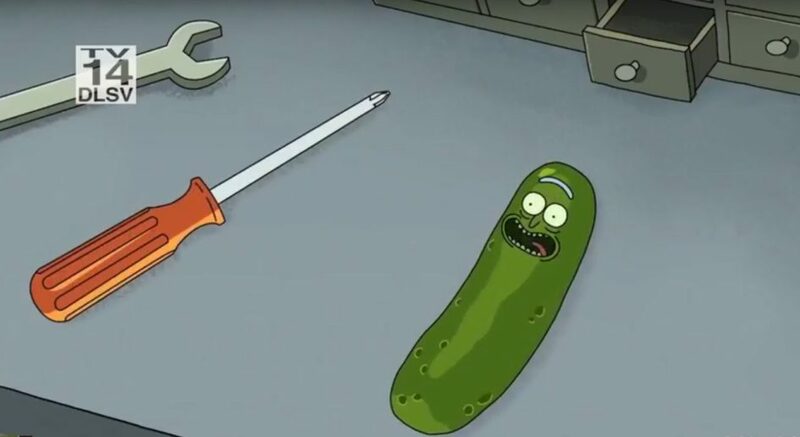 But mad scientist grandpa Rick’s reason to turn himself into a pickle is not really to see if he could, or somehow stretch the boundaries of science, it’s to get out of family counseling. Following the divorce of Morty’s parents, Morty and his sister, Summer, have been having some trouble at school. While a bit of counseling might help the grand-kids, Rick doesn’t want anything to do with it. His plan to avoid counseling works, but he winds up in… well, a pickle. A grand solo adventure unfolds for Rick. He winds up in the sewers, gets himself some cockroach arms and legs, then he sciences himself up some rat appendages and fights his way through a hoard of feral sewer rats in a fight scene so well choreographed, it looks like it was lifted from the hallway fight scene in Oldboy. It’s probably one of the most violent, gory and extended action sequences I’ve seen on this TV show, but it flows like a ballet. You almost have to admire the animators. They showed the rough animation sequence of the fight at 2016 San Diego Comic-Con and it’s incredible to finally watch the finished product. 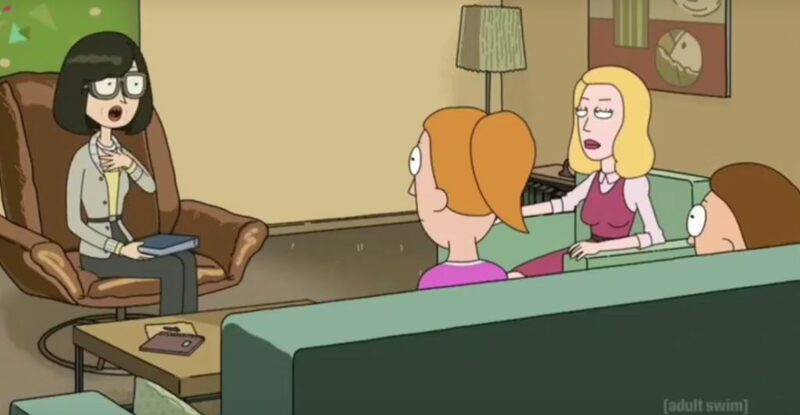 Usually, it’s Rick putting his grandson, Morty, into impossible situations, so it’s a nice change of pace to see Rick paint himself into a corner and then get out of it. You have to marvel at his engineering skills and the way he’s made weapons out of everyday objects, like Iron Man. He even makes a flight suit to escape the sewers. Would you believe me if I said that it gets even more crazy for Rick from there? Well, it does, but I don’t want to spoil it. Suffice it to say that it’s got the kind of one-vs.-lots-of-bad-guys action sequences that would make movies like Commando or Die Hard proud. 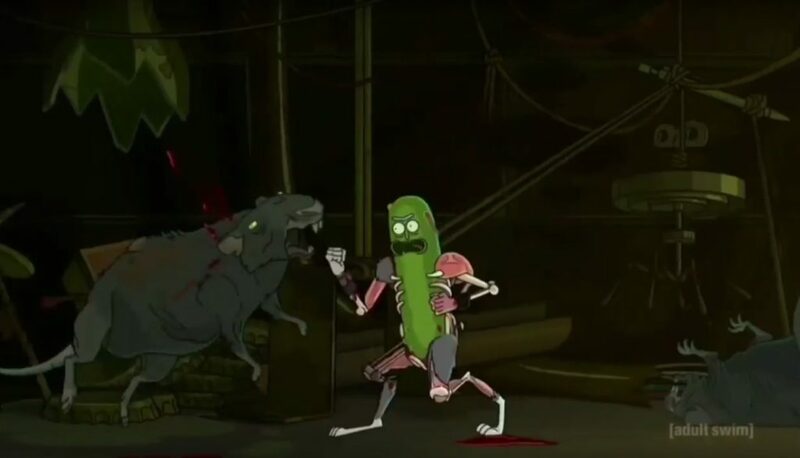 While I definitely encourage you to watch “Pickle Rick,” I can’t say the same for the sub-plot with Morty and Summer and their mom. Compared with the action from the rest of the episode, their scenes are like pulling the emergency brake when your car is speeding down the highway. They’re painfully boring, unfunny and I almost skipped over them when re-watching the episode to write this article. Their shrink is even voiced by Susan Sarandon (The Rocky Horror Picture Show, Thelma & Louise), because apparently one of her children likes the show. But the famed actress brings nothing to the table, she only verifies what the audience already knows and fosters no character development. If she was funny, I could forgive that, but in the end, it only seems like a waste of talent. Also, she plays Dr. Wong. “…Racist name, by the way,” Morty’s mom, Beth, comments. But even with this aside and fourth-wall break acknowledgement, why have Susan Sarandon voice an Asian character? The counselor believes in pop-psychology. Why not make a character off that or make her a white, aging hippie? Anyway, even if you skip past the counseling scenes, be sure to stay tuned for the mid-credit sequence. 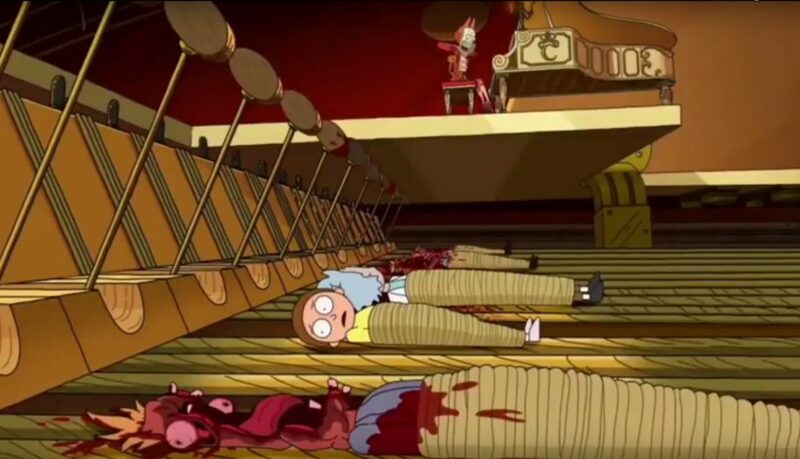 We get to see Rick and Morty strapped to a giant piano of death, like some Bond villain deathtrap or ’70s-era Adam West Batman predicament. How will Rick and Morty escape? Find out!